You can string a musical campaign by availing this custom guitar shape bottle opener music keychain! Makes an apt value building choice for music industry moguls, guitar classes, music bands, food and beverage industry professionals, entertainers, hospitality marketers and many more. Perfect for gifting during music festivals, trade expos, business conferences, trade conferences, anniversary celebrations, etc. An apt choice as an individual gift as well as a complimentary or combo gift. 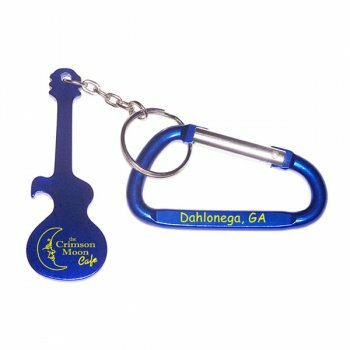 We offer discounts on wholesale orders of this guitar shape bottle opener music keychain. Request a quote to know discounts on wholesale customized guitar shaped bottle opener keychain. Available product colors - Metallic Black, Metallic Blue, Metallic Gold, Metallic Green, Metallic Orange, Metallic Pink, Metallic Red and Metallic Silver. Imprint Area :3/4" x 5/8"
Product Size :3" x 1 1/16"